Facebook says, “Sorry, something went wrong. We’re working on getting this fixed as soon as we can”. If you’re seeing this error message when you open Facebook.com or when you try to login to Facebook on your desktop computer, or via an app on your mobile, it means something just went wrong on Facebook’s side and you’ll need to come back later. Well, I wrote this post not just to tell you to wait, but to show you possible solutions if you’re still seeing this error hours or even days later. This error message may shows up as of 2013 and 2014, possibly 2015. It may be a completely different error message in the future and of course the below solutions may not work in the future as Facebook updates itself. I am just one out of millions other experienced Facebook users. I do not represent Facebook and this website is not affiliated with Facebook in any way. If in doubt, please seek answers else where. If you’re seeing this fresh, you may want to give them some time and let them do their job to fix problems from their side. If you’re still seeing the message after hours of waiting, then it may be your side which causes the problem. 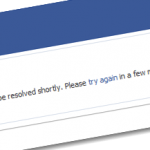 Facebook may have been down for a few minutes but if you’re seeing the same error message continuously it most likely means that the error message is a cache page your phone is showing you. A cache page means a page saved on your phone so the next time you visit the same page it will get it from your phone instead of wasting time and resources to reload the page. In this case, you will want to clear the cache. In Android, you can clear your cache via Setting, App Manager, Facebook (or internet browsers such as Chrome, if you’re logging into facebook using one), then hit “clear cache” and “clear data”. 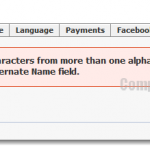 This will remove previously saved caches and data including your login credentials. Restart your phone and open Facebook again. It should work now. Desktop? Facebook: sorry something went wrong. We’re working on getting this fixed as soon as we can. If you see this on a desktop computer, like the screenshot I posted earlier, same things apply. Chill out and wait for a awhile. Come back again an hour or so later and if it’s still there, it is most probably a cache page as well (unless of course if all your friends cannot access to Facebook too). To clear cache in Google Chrome browser, click on the menu button (or a wrench icon) at the top right corner on your Chrome window. Click Tools and then “Clear Browsing Data”. Select “Cached images and files” and “Cookies and other site and plug-in data”, and then click “Clear browsing data” to begin clearing them. Close Chrome and relaunch it. Open Facebook and login again. It should works now. Well, if you’re using Mozilla Firefox, to clear the browsing cache, go to Tools, Options, Advanced tab, Network tab, and then hit “Clear Now” under “Cached Web Content”. As for Internet Explorer, Menu, Internet Options, General tab, under Browsing history hit “Delete”. Select “Temporary Internet files and website files” or keep the default selection and then hit delete to proceed deleting. After clearing out the cache, relaunch your browser and open Facebook again. It should works just fine. It may be your account’s issues. It’s best to seek help from Facebook Help page – https://www.facebook.com/help. 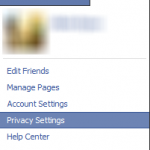 You should also check out Facebook Login precautions and best practices and one of the most common Facebook error: Why is my Facebook Account Temporarily Unavailable.